We have a Halloween party each year with a theme. The theme for 2017 was Hawaiian Luau, 2016 was Famous Chefs, 2015 was a Traditional Halloween, 2014 was Day of the Dead, 2013 was Famous Couples, 2012 was Hobos, 2011 was Toga Party, 2010 was a Murder Mystery. In 2009, the theme was Hippies, 2008 was Jumpsuit Party, and in 2006 the party theme was Pajama Party. There are also pages of my party themes from the past include (2005) Black and White, (2004) Retirement Home Party and Early Bird Dinner, (2003) Pirates of the Caribbean, and (2002) Elvis. Here is enough information to give you ideas as you plan your own party. 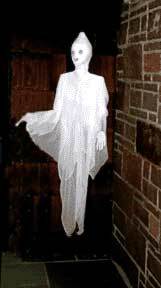 The Halloween Museum is your starting point to discover the wonders of Halloweens past. 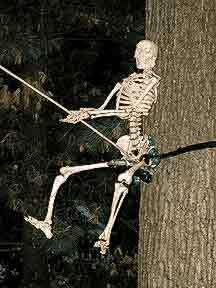 There are 50 to 100 year old Halloween decorations, Links, Decorating tips, a History of Halloween, and lots of Halloween ideas. 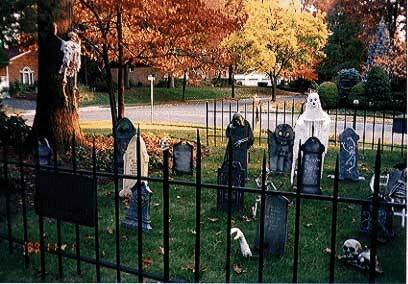 I love the homes that create a complete graveyard or ghostly scene outside their home. I decorate the inside of the home with vintage halloween decorations and the outside is decorated with pumpkins, cornstalks, spiders, bats, spider webs, a skull wreath and anything that will give visitors the creeps. 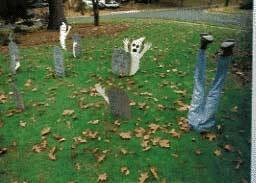 About 16 years ago, I began to turn my present front yard into a graveyard. At first gravestones were made out of heavy cardboard. Soon I added cardboard ghosts. (This photo was taken about 1990) Autumn rains would warp the pieces and the lack of depth to the stones bothered me. I soon found styrofoam headstones and bought a few. I found that when I painted an inscription on them, the enamel paint would eat into the styrofoam and create an engraved look. Soon I located sources for hard foam headstones . These had depth, charactor, and were made to last. My collection of these began to grow. There are now 27 headstones. The front yard feels like a graveyard. Each year brought more great finds such as life-like rats and bats. Most items are available for only the year in which I find them. Now the neighborhood kids make the house the priority stop as they trick or treat. The project grows each year. One year, I found websites with instructions to make my own gravestones with insulating foam panels. The kids and I made a few nice headstones. Two of our year 2000 outside displays - The Fishing Skeleton with a bat on the line (check www.anatomical.com for bones and skeletons) and the Flying Crank Ghost (FCG). The FCG is a mechanical life-sized puppet lit by black light. It glows softly and moves up and down. This stops visitors dead in their tracks. A 1999 photo of the front yard. 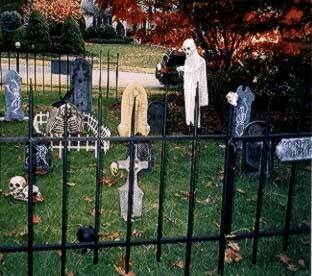 We added more headstones, two life size skeletons, and a removable fence (for instructions, see Jello & Fence page). See the night time photos. New pieces are added each year. One year the party theme was Outer Space. Here's what the outside of the entrance looked like. The flying saucer on the roof was made with two cheap beach umbrellas that were cut down and attached to each other and then painted with gold spray paint. Chaser type lights were put around the edge and a Martian face was wired on. Attaching the piece to the roof was a challenge because of the possiblity of wind and rain. I put a 50 lb. elevator weight into the saucer and tied a rope to the umbrella poles and anchored it to the other side of the roof. This way it looked free standing but was pretty solidly anchored. 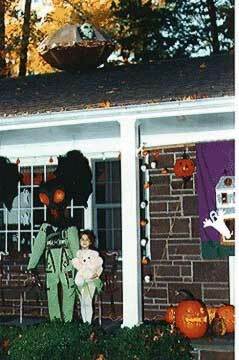 The alien of the porch was a manikin with a mask and astronaut costume from the 1960s. There are about a dozen hand carved pumpkins. I usually take them all in on the night before Halloween - Mischief Night. 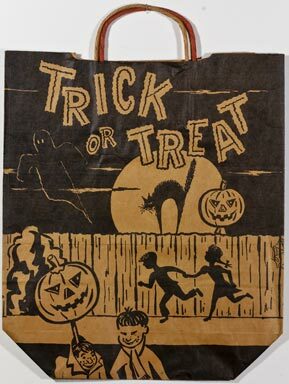 I collect old Halloween items and among my favoritse are the Trick or Treat bags (called "sacks" west of Ohio). The actual practice of trick or treating in the United States began from an attempt to stop the vandalism that was occurring on Halloween. There is no record of formal trick or treating before the 1920s. Since the 1890s, Halloween had been a time for playing tricks on neighbors. Most of these tricks were rather harmless, but over the years, the pranks became more dangerous. Older boys might plan a night of terrorism which could include, removing gates or stairs from the front of houses, changing signs, and worse. Kids wore disguises so that they would not be recognized. Store keepers and neighbors began giving treats (bribes) to the children to stop the tricks and the kids started going door to door. Towns, the Boy Scouts, and other groups supported these supervised activities. The idea was a success and by the 1930s, the custom was established and began spreading across the country. 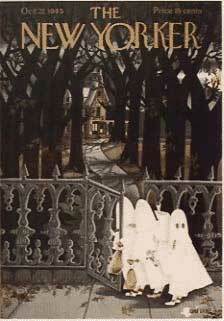 "Trick or Treat" became the Halloween greeting during the late 1930s or early 1940s. In many places the expression was slightly different. An example is "Trick for a Treat", meaning I will do a trick for you, such as sing a song or tell a joke, if you give me a treat. There are many regional variations. The practice is spreading worldwide and has a good foothold in France and Great Britain. The earliest trick or treat bags were probably pillow cases or small baskets. 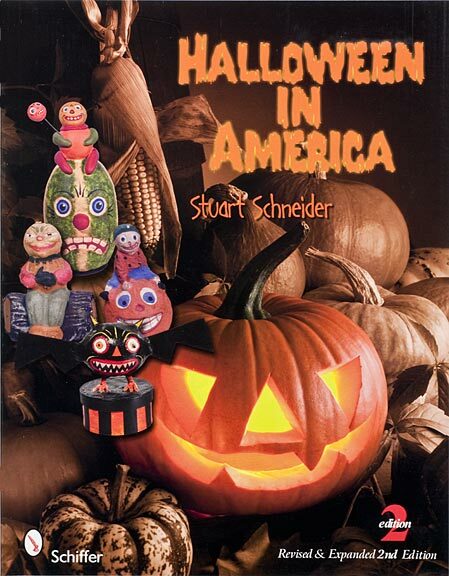 The commercially decorated ones, with Halloween pictures, did not appear until the late 1940s. By the 1950s, numerous stores and companies were offering paper bags with their names or products shown. The words and imagery on the bags is what separates the good from the great. Some simply say "Trick or Treat" while others show Halloween images such as witches, bats, cats and ghosts. are again offering plastic shopping bags with a Halloween design and warnings about safety. Books #3 on Flashlights, Picture Frames & Halley's Comet | Ghosts In The Cemetery| Waffle Recipies| Links Copyright 2000 through 2019 by Stuart Schneider. Do not use any parts of these pages without written permission.